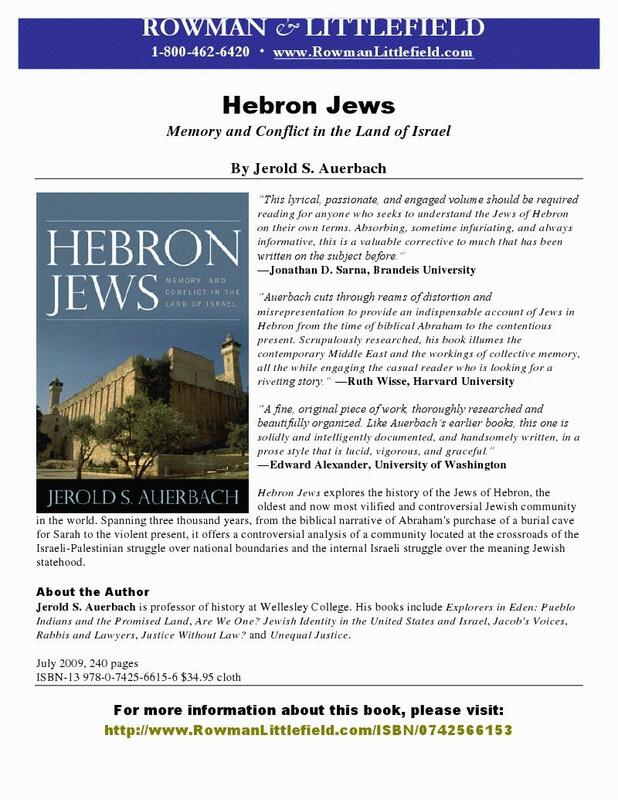 Prof. Jerold Auerbach monumental work Hebron Jews: Memory and Conflict in the Land of Israel is the first comprehensive history in English of the Jews of Hebron. It covers the ancient community from the time of the Bible, through the Middle Ages, to the modern era and the dramatic repatriation of the city in contemporary times. Jerold S. Auerbach is professor of history at Wellesley College. His books include Explorers in Eden: Pueblo Indians and the Promised Land, Are We One? Jewish Identity in the United States and Israel, Jacob's Voices, Rabbis and Lawyers, Justice Without Law? and Unequal Justice. His articles and reviews have appeared in numerous journals, including The New Republic, The Nation, Harper's, and The New York Times.